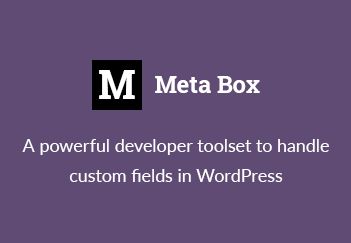 My popular plugin Meta Box, a plugin that helps developers/users to create custom meta boxes and custom fields easily in WordPress now has its own domain: metabox.io. That website will be dedicated for Meta Box plugin and all its extensions. I’ll be adding more documentation on the website soon as well so developers can develop their own extensions. One thing I want to confirm is: the Meta Box plugin is always free. It’s released under GPL 2+ and available on WordPress.org. It’s also being (and will be) developed actively. Besides that change, I’m going to shutdown support at old Forums and use Github Issues to track bugs and receive feature requests. It’s a lot more easier to discuss about bugs, refer to another topics, show code and get notifications. I hope you remember the domain, but don’t forget to visit my blog to read my posts!